This is the third of a four-part series on young Singaporeans who have ventured beyond the conventional academic tracks and followed their aspirations. Her grade point average of 3.5 out of 4 easily qualifies her for courses at local universities. Yet for visual communication diploma holder Vivien Ong, a degree can wait. 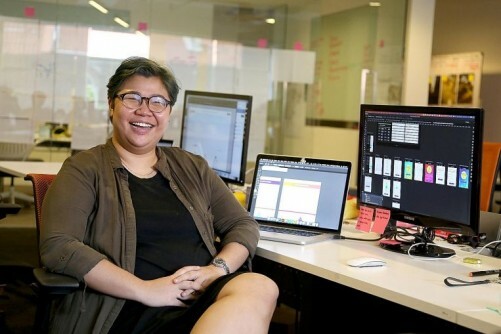 For more than a year now, the 23-year-old has been crafting visual designs for clients as a designer with digital creative agency Sapient-Razorfish, which taps technology such as data and artificial intelligence to help brands better reach out to their customers. Ms Ong said that in her line of creative work, being in the thick of the action would stand her in good stead. "I believe solid industry experience is a better way for me to learn the craft," she said. Ms Ong has worked on projects for major firms, such as brewery and distributor Asia Pacific Breweries and consumer goods giant Unilever, since joining the agency in May last year. She did so well that she was promoted from a trainee designer to a full designer. When asked if she is losing out to her peers who are now in university, Ms Ong, who graduated with a visual communication diploma from Nanyang Polytechnic (NYP) last April, said: "It is not about who is doing better. When you work, you learn something. When you go to school, you learn a different set of knowledge. "While (my peers) deepen their learning in school, I've got a couple of years head start in the industry, so everyone wins." She believes the early exposure to the workplace has equipped her to better handle the demands of the working world, whereas a graduate would need time to navigate beyond the comforts of a more forgiving school environment. Ms Ong, who is from a single-parent family, also has the support of her 67-year-old mother, a kitchen hand at a foodcourt, who lives with her in a four-room flat in Hougang. "Definitely, the generation before us still thinks that holding a paper degree is more beneficial than anything else," said the only child. "But as long as I have a good job and am doing what I like, my mum is fine with it." While she does not deny the value of a degree, Ms Ong always desired to learn on the job, which she believes would help her discover more about her love for design. She eventually embarked on a less travelled route - the SkillsFuture Earn and Learn programme. This allows fresh polytechnic and Institute of Technical Education graduates to work and earn an income while gaining a qualification, such as a specialist diploma, at the same time. Under this programme, participants get job training, work on projects or even go on overseas attachments for 12 to 18 months. Typically, they work for four days a week and devote a day to studies. From May last year, Ms Ong spent a year on the programme, pursuing a specialist diploma in visual communication at NYP while being attached to her current agency as a junior designer. For the first six months, she attended classes every Monday and worked for the rest of the week. After that, coursework was done through e-learning. Besides getting support from her lecturers, she also sought advice from the seniors at her workplace. "In school, you learn about the concepts," she said. "But at work, you put that learning to use." But juggling work with school was not easy, admitted Ms Ong, who would often be left with little time to complete her school assignments due to a hectic work schedule. "I had to give up my weekends to finish my school assignments." Despite starting off in a junior role, Ms Ong credits the office culture for allowing her to step up her design game. Right from the start, she was given responsibilities beyond a trainee's scope of work, so it "did not feel like an intern's job at all". This included working alongside art and creative directors to craft visual content to sell a client's message to its intended audience. For example, if a client's website was not getting enough traffic, her team worked together to get to the root of the problem - which could be anything from a wrong placement of buttons to a choppy navigation interface - and came up with a better configuration. "In a team, you can have people with very different personalities, but who can work together to produce a very good product," said Ms Ong. "When the clients come to us with an issue, we solve the issue for them and we make it look pretty." At her agency, everyone's opinion gets equal billing. "The thing about this office is that you can talk to anyone and everyone. There is no such thing as if you are an intern, you can't talk to the managing director," she said. "Every single person, no matter his or her role, can step up and be heard. It is a good place to break out of your comfort zone and make decisions." The agency's executive creative director for South-east Asia, Mrs Claire Waring, was so impressed with Ms Ong's eye for design that she chose the youngster out of a large pool of promising candidates. "She didn't just design things to be pretty, every piece in her portfolio had real thought behind it. She struck me as someone who was curious, and that's good for someone in the creative line," said Mrs Waring, who was Ms Ong's supervisor when she joined the firm under the Earn and Learn programme. "She has since been a great fit for us. She is willing to take risks and do things never done before." Ms Ong continued to impress throughout her stint. This eventually secured her a job at the firm before she completed the work-study programme, with a promotion from junior designer to designer. Mrs Waring, who herself worked part-time while at university, believes the Earn and Learn programme is a fantastic way for young people to get the best of both worlds - exposure to the workplace, with real briefs and real clients, while getting an education at the same time. "This industry is fast-paced and forever changing," she said. "Anyone who can gain both industry experience and an education has the advantage.They get to apply what they have learnt in school and also get a head start in their career." From a young age, Ms Ong was more attuned to her creative side. Rather than words, she preferred pictures and drawings. "Back in my school days, all my notebooks would be filled with doodles. When I took notes, there would be tiny drawings at the side to help me learn a bit better," she said. "I daydreamed a lot. It could be a science class and I would be drawing butterflies." The Bowen Secondary alumnus went to the extent of doodling on her examination papers. "When I got back the papers, I would get comments like 'nice drawing, but don't do this again'," she said, laughing. However, Ms Ong does not downplay the importance of an education, noting that it gave her a firm foundation to pursue her interests. "Furthering my education is definitely in the plans, but I am now trying to save up to fund the right kind of education," said Ms Ong, who is considering taking up a communication design degree overseas. For now, she is looking to do short courses to upgrade her design skills. "There's only so much you can learn at work. There's some point when you need to upgrade your knowledge," she said. "If you do something for a long time, you might get stuck in your own comfort zone and the knowledge can get rusty." Search for jobs related to Architectural Services/ Interior Design here!